Top image: Astronaut Scott Kelly. Credit: Andrey Alistratov. Middle image: Mars. Credit: Space City Films. 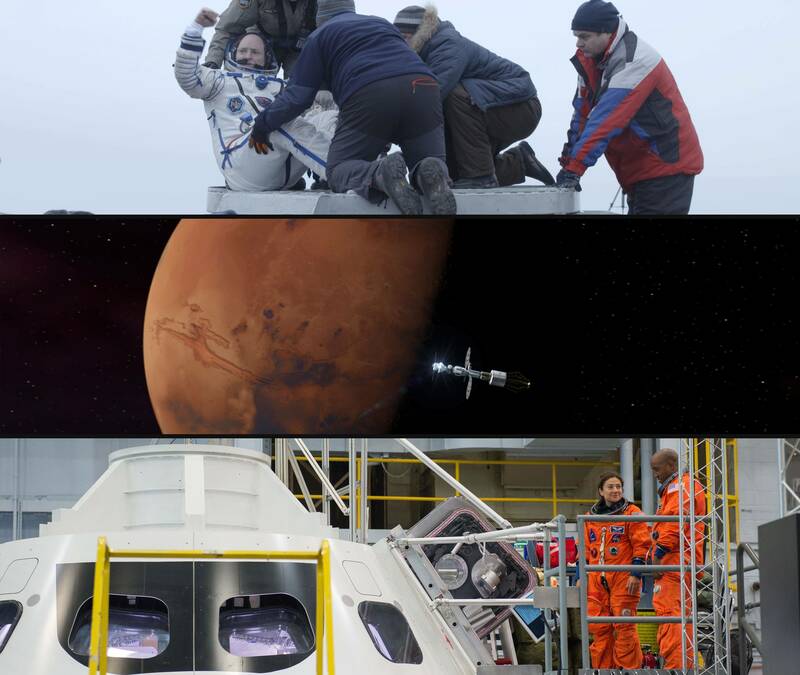 Bottom image: Astronauts Jessica Meir and Victor Glover. Credit: Lauren Harnett. Pasadena, CA; January 15, 2017 – PBS President and CEO Paula A. Kerger announced today at the Television Critics Association Winter Press Tour that BEYOND A YEAR IN SPACE, a follow-up documentary to 2016’s A YEAR IN SPACE special, is scheduled to premiere on PBS in November 2017 (watch a clip). The two specials, adapted from TIME’s original digital video series about astronaut Scott Kelly’s 12-month stay on the International Space Station (ISS), explore the human limitations for space travel and what a mission to Mars will require. BEYOND A YEAR IN SPACE picks up where the first film left off: Scott Kelly’s last day in space and return to Earth. The final installment also introduces viewers to the next generation of astronauts training to leave Earth’s orbit and travel into deep space. BEYOND A YEAR IN SPACE tracks Scott Kelly’s homecoming after a historic year in space – the longest space mission in American history. In addition to seeing Scott’s long-awaited reunion with his family and friends at home in Texas, the film follows Scott and his identical twin brother, and fellow astronaut, Mark Kelly, as they undergo testing for NASA’s twin study. The twin study hopes to identify precisely what changes Scott underwent after 12 months aboard the ISS by comparing him to Mark, who spent the year on Earth. The data NASA aims to gain from this study will help scientists understand what it will take for humans to endure long-duration space travel. Viewers will meet Jessica Meir and Victor Glover, two of the astronauts preparing to venture farther than humankind has ever gone. BEYOND A YEAR IN SPACE features interviews and a behind-the-scenes look at how these astronauts are training to go the distance. Viewers will also learn what it means to each of them to be one of the few human beings to venture out of Earth’s orbit, beyond the moon, into deep space and possibly to Mars. “BEYOND A YEAR IN SPACE takes a deep look at one of humanity’s greatest scientific achievements and provides a lens into Scott Kelly’s personal journey, and what it means for the next generation of astronauts training for Mars and beyond,” said Beth Hoppe, Chief Programming Executive and General Manager, General Audience Programming, PBS. TIME, owned by Time Inc., created A YEAR IN SPACE in 2015 as a yearlong, 12-part digital video series, produced by TIME’s Supervising Producer Jonathan Woods and directed by Shaul Schwarz. The episodes can be found on Time.com/space. The A YEAR IN SPACE website on pbs.org features a suite of exclusive short-form videos detailing aspects of life on the International Space Station, as well as photos and videos shot during the mission. Visitors can also explore biographies and learn more about the Twin Study. Conversation about #YearInSpace on social media is reflected through a social hub on the site. Users also have the opportunity to view PBS archival materials about space exploration. Upcoming conversation about this special can be found using #BeyondYearinSpacePBS. BEYOND A YEAR IN SPACE will be available to stream the morning after broadcast on all station-branded PBS platforms, including PBS.org and PBS apps for iOS, Android, Roku, Apple TV, Amazon Fire TV and Chromecast. Time Inc. (NYSE:TIME) is one of the world’s leading media companies, with a monthly global print audience of over 120 million and worldwide digital properties that attract more than 140 million visitors each month, including over 60 websites. Our influential brands include People, Sports Illustrated, InStyle, Time, Real Simple, and Southern Living, as well as more than 50 diverse titles in the United Kingdom.